I’m doing my best to avoid having this post devolve into an anime-centric column, but there are a couple of things working against me: A) What I wind up reading is not always something I feel like talking about for one reason or another (some things aren’t so much bad, which is perfectly valid review, as they are unnoteworthy) B) I didn’t get to finish reading something I do want to talk about in time, and C) I feel like there’s a lot of good scifi and fantasy to be found in anime that folks might otherwise miss out on. With that said, onward! When I wrote about RahXephon back in May, I mentioned my love of mecha (giant robot) shows. Now, mecha shows nominally come in two flavors: “real robot,” where ammo, fuel, and the like are a concern, and “super robot” shows, (careful, TVtropes!) where the mechs might as well operate by magic and do things like shoot their fists off. You do get some drift back and forth between the two. Neon Genesis Evangelion is pretty much a real robot show where the parent technology falls under Clarke’s third law– it’s indistinguishable from magic. You could argue that RahXephon is similar, but you could also probably argue that the robot tech in RahXephon is magic impinging on a real robot world. 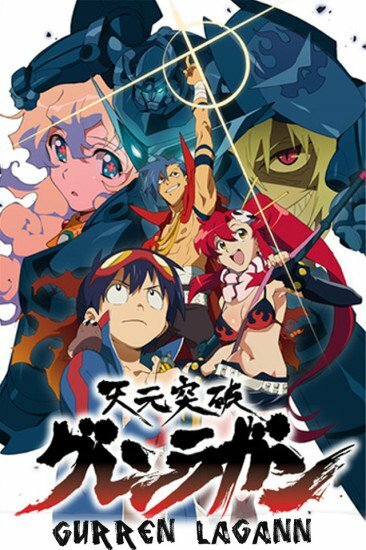 On the flip side of all that is Tengen Toppa Gurren Lagann. It’s a super robot show, it knows it’s a super robot show, and it’s okay with that. It is, in fact, more than okay with that. It loves what it is with a man’s deep and burning passion. It’s so okay with it that opens with what is at least a galaxy and very likely might be an entire universe exploding while determined men look on in approval. After the first episode’s cold opening, we’re show a world that is very different from the space opera that just went before: A dismal underground village whose inhabitants have never seen the surface and believe to be largely a myth. Teams of young men drill out new tunnels so that the village can expand, but beyond that, there is very little that happens until one day, Simon, a young driller, finds a strange, glowing drill bit as he’s digging; a little while later, he finds… a robot face that reacts to the drill bit. Simon seems to be largely disliked by the local villagers; his only friend is Kamina, a good-natured if somewhat thick-headed troublemaker who has taken Simon under his wing. Kamina’s dad disappeared trying to find the surface, and he’s intent on finding him, regardless of how people mock him for his irrational belief in the surface. That mockery doesn’t last long. 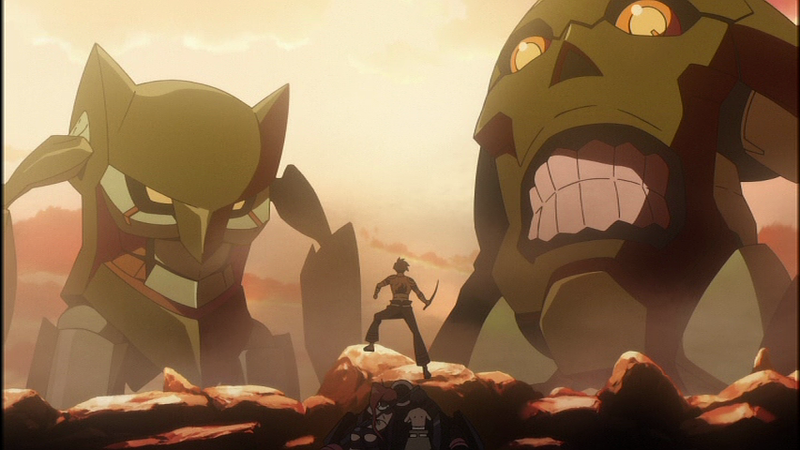 The village’s roof collapses during an earthquake caused by an enormous mech stomping around on the surface, bringing both the mech and the young woman, Yoko fighting it down into Simon and Kamina’s village. There’s a sequence that amounts to a fair amount of comedic flailing around before we settle down into the important stuff: that “face” that Simon found is, in fact, a small but very special mech. There are other human villages, all underground, and the surface is ruled by beastmen who exterminate any human they find on the surface. No one knows why or where they came from, but Yoko’s village was exposed to the surface during an earlier earthquake and they’ve since been fighting the beastmen as best they can with no mechs and only a handful of firearms. Fortunately for the human race, Kamina’s too stubborn to realize that it’s impossible to overthrow an entire mecha-equipped army and Simon’s too loyal to the only person who treats him well to not follow along. One thing is two things are going to stand out to anyone watching this show: first, it’s goofy as all heck. Second, the mecha design is… also goofy as all heck. None of the “gunmen” have heads, and instead having faces embedded in their torsos. I’m given to understand that it’s a pun involving the English word “gunman” and a Japanese word for “face,” but my Japanese is both bad and rusty, so I can’t really confirm that first hand. Both of these things take a little bit to get used to, but once the story picks up, you won’t notice it one bit– except, perhaps, in some of the goofier segments where the silliness is the point of it all. 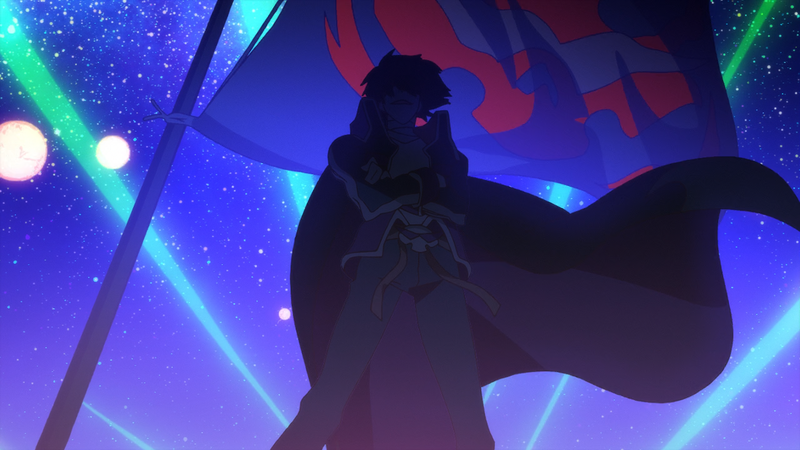 That having been said, for all the show’s goofiness, if RahXephon was what you’d get from a Gene Wolfe giant robot story, Gurren Lagann is what you’d get from an E.E. “Doc” Smith robot story. One of the show’s repeated themes and motifs is that of the spiral, and the narrative follows that rule same as anything else. There are at least three, probably four places in Gurren Lagann where I remember thinking “How in the world can they go anywhere from here?” only to have the stakes ratcheted up into territory I never would’ve seen coming. The show’s eventual arc looks very much like the arc of Doc Smith’s Lensmen books in scope– maybe even bigger. And while the show’s goofy, it’s also about as earnest as the Doc Smith’s books ever got to be. Like I said, it knows what it is and it’s okay with that. It knows it’s in a genre where it frequently seems that robots don’t fight as well as they could until their pilots are really pissed off, and it takes that and runs with it. 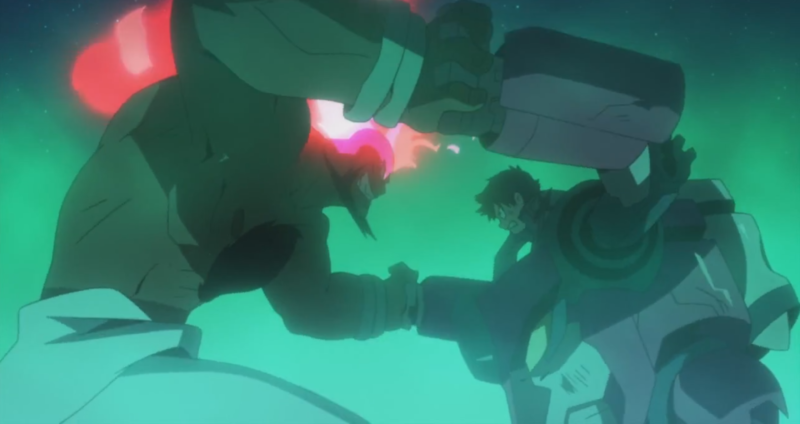 “Fighting spirit” and “a man’s spirit” are unironic themes that Gurren Lagann comes back to again and again in a way that’s really refreshing. There’s an arc where something terrible happens, and Simon descends into an angsty depression that looks a lot like Evangelion‘s Shinji– but after a few episodes, Simon snaps out of it and comes back in one of the most satisfyingly manly moments I’ve ever seen in fiction. I do have a few quibbles. The show can be a little tastelessly raunchy, although that’s mostly limited to the requisite hot springs episode. A couple of the initial episodes meander a hair too much while they’re introducing characters. Most egregiously, while the VAST majority of the show is quite nicely superversive (heroism, sense of wonder, and great storytelling) it trips up on something kind of huge in the last few moments of the show. I can’t really go into it without essentially spoiling the whole darn show, but after 26 episodes of nonstop heroism, the epilogue has a strange moment of apathy. It doesn’t ruin the show by any means, but it doesn’t really jive with the show’s previous MO of “Do what’s right and we’ll make sure it works somehow.” None of these quibbles are enough to take away from making the show one of my favorite scifi series ever, though. Gurren Lagann is most readily available on CrunchyRoll. I’d kill for a decent Blu-ray release, though.